Maintain a comfortable home with Honeywell and Ecobee thermostats. Their accuracy and easy-to-use designs make them among the most trusted names in the industry. The Lyric thermostat by Honeywell is ideal for customers who are always on the go and want optimal comfort and savings they don’t’ have to think about. Instead of operating on a fixed schedule, Lyric uses your smartphone location to automatically adjust the temperature as you come and go – delivering comfort when you’re home and savings when youre away. It’s the next generation of connectivity. Ecobee programmable thermostats are Apple® HomeKit enabled so you can control the temperature remotely using your compatible device. Home IQ helps you conserve energy. It reads the temperature in multiple locations solving for uneven temperatures in the rooms that matter most. The Ecobee 4 thermostat intuitively understands when to turn on your heating or cooling equipment based on your home's unique energy profile and the weather outside, making sure you're comfortable at all times. And it senses whether anyone's home and which rooms are occupied, delivering comfort when you're at home and saving you energy and money when you're not. Ecobee thermostats save homeowners an average of 23% annually, paying for itself in energy savings. Click the Ecobee logo to visit the Ecobee website product line. 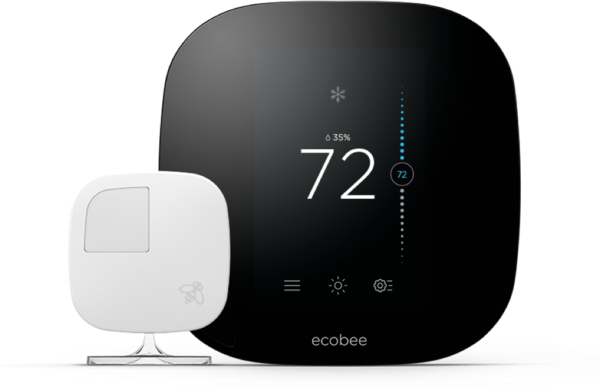 We carry a complete line of Honeywell and Ecobee thermostats. Let us help you choose the one that best matches your lifestyle.